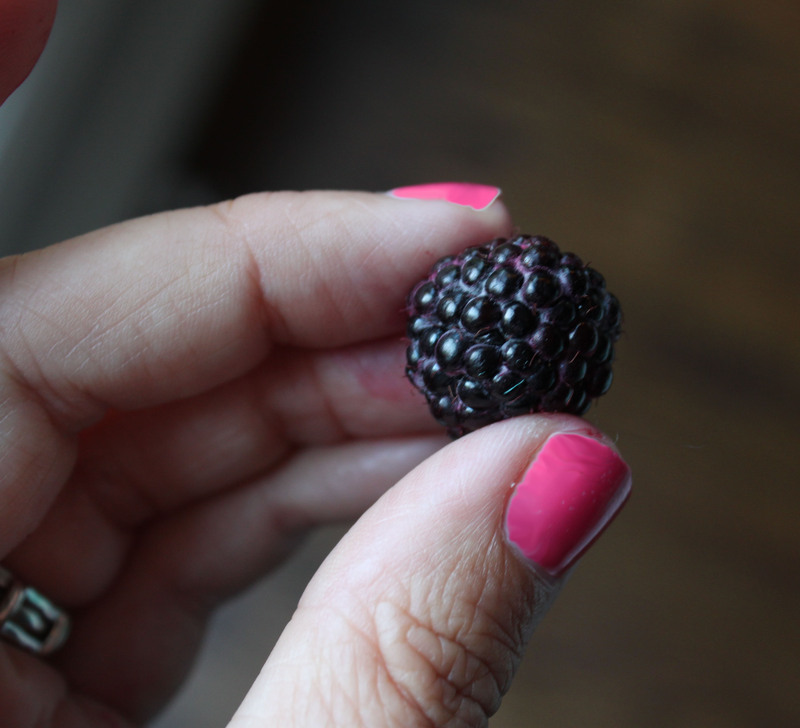 Have you ever had black raspberries? Apparently they are native to North America. They’re a wild raspberry and they have a more rich taste, some call it “wine-y”. I personally like the tartness of red raspberries but I’m pretty sure my little guy likes these better and I know my husband does. 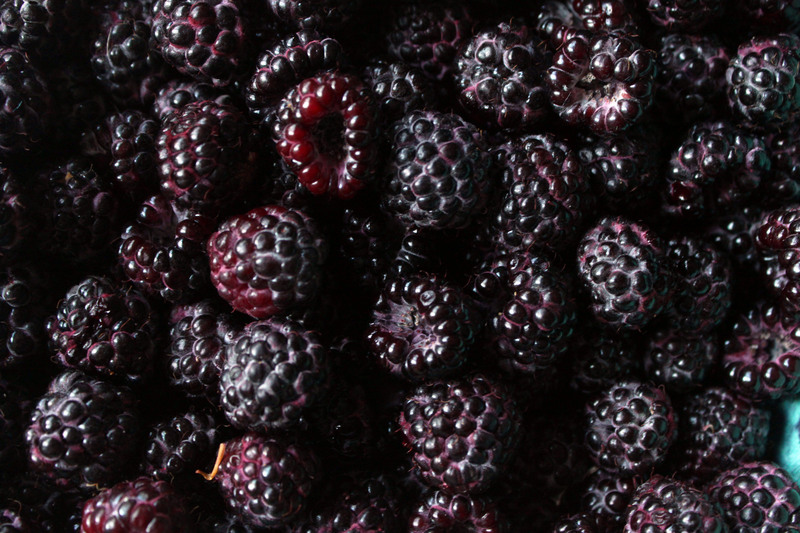 So, what are Black raspberry preserves? Preserves in general are very similar to jam, they are fruit and sugar, cooked to form a thicker spread. Same ingredients, the only difference is that the fruit is cooked in larger chunks, or in this case, with raspberries, the fruit is left whole. Generally, preserves are chunkier than jams, however, these black raspberries (or all raspberries for that matter) tend to break apart relatively easy so my black raspberry preserves don’t end up being much different than my black raspberry jam. Back when we were living in Chicago, my husband and I would take a day trip to an orchard in Indiana called Garwoods. It was kind of a hike (like 2 hours) but if you’re in the city it feels so nice to get out of the hustle and bustle and get into the country. They had tons of different u-pick options. Their main crop is apples in the fall but we’ve picked tomatoes, peppers, raspberries, green beans, and more from them. 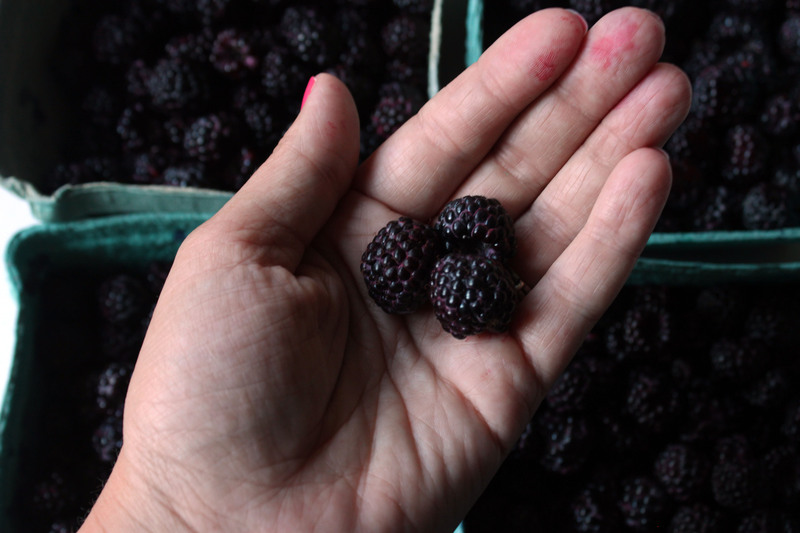 One crop they had that was new to us was black raspberries. My non-raspberry loving husband fell in love – I think it’s because they’re sweeter. I made jam and he’s been talking about it ever since! We were headed up to Charlevoix, Michigan (a really beautiful place where I spent my childhood summers) at the end of July for the annual Venetian festival. For some reason we put on our navigation (even though we have driven this route a million times before). The navigation took us a different way – a beautiful way with rolling hills, farms, and differing views of Lake Charlevoix. On the way I also spotted a u-pick strawberry farm. I looked it up and what do you know- they have black raspberries! Mark it on the calendar, we’re picking the day before we leave and I’m making us some jam! We got to the farm and LO was super excited because whenever he sees a barn or a white farm fence he says “bahhhh” and thinks there are animals. There were animals but I decided to keep the LO away from them until we were done picking. Off to the fields we went. Black raspberry bushes seem more thorny to me so I had to keep a pretty close eye on little man. I showed him how to pull a ripe raspberry off the bush and went about my business picking them and putting them in my quart container. LO picked another and ate it “mmmmmm”. He was doing pretty good until there were no more ripe raspberries on that particular cane, he started trying to pull off and eat the unripe berries (that don’t pull off of the bush and therefore were super thorny because they still had part of the cane attached). I decided it was time to have LO help hold my container, I gave it to him to hold. I grabbed another handful of berries and turned around to deposit them into the quart container and what do I see? Little man is shoveling, I mean SHOVELING handfuls of the ripe berries I had just picked into him mouth. I died! In a matter of seconds all of the berries were gone. I dropped in another handful – gone again – and again- and again! Eventually I gave up, LO and I went over to pet the goats and dad stayed in the field to pick the berries (4 quarts to be exact). It was the cutest thing ever! The juice from the berries was everywhere, all over his hands, all over his face. So cute! Look at these gorgeous berries! Anyways….. finally – to the canning! First and foremost, do you have all of your canning supplies? If not, you’ll need to get them before you can do this. I would appreciate it if you made them via the following affiliate links. When you click through the link and make a purchase, I make a small commission to help fund my blog (it doesn’t have to be what I’m recommending and you’ll never get charged more). My full disclosure is here. For all canning, you’ll need to know the basics such as properly sanitizing your tools and jars and water bath canning. I would recommend reading this post from Ball on canning basics. You will also need something like I have, like this – Granite Ware Canning Kit, 9-Piece that includes the enamel pot and rack, a funnel, a jar grabber, a head space measuring tool, etc. For this specific recipe of preserves, you will also need Ball Canning Half Pint (8 oz.) Jars with lids and bands. This recipe is from the Ball Blue Book. I obviously used black raspberries but this can work for red raspberries, blackberries and logan berries. It makes about 4 half pints. Make sure you have your jars sanitized and all of the prep work needed done before you start. Then, combine your berries and sugar in a heavy pot. Let them sit until the juices begin to flow (about 10 minutes or so). Place over a medium high heat and bring slowly to a boil, stirring until all of the sugar has dissolved. Cook rapidly until it’s almost to a gelling point. As the mixture thickens, make sure that you’re stirring it frequently to prevent it from sticking. Once it’s ready. Remove it from the heat and skim foam (if there is any). Ladle the preserves into hot jars, leaving a 1/4″ headspace. Adjust 2 piece caps and process for 15 minutes in a boiling water bath canner. Then enjoy on toast, or, like we did this morning, heated slightly on top of my gluten free pancakes!